Katy Lopez, MD, a board-certified Family Practice physician, has joined the Augusta Health Family Practice office in Verona. The practice is located at 1 Green Hills Drive, just off Route 11, in Verona. The office phone number is 540.245.7425. After graduating from Stetson University in Florida with a degree in Molecular Biology, Dr. Lopez earned her Doctor of Medicine from the Ross University School of Medicine. She completed her family medicine residency in Canton, Ohio in the Aultman Hospital Family Medicine Residency Program. She is certified by the American Board of Family Medicine and is a member of the American Academy of Family Physicians and the American Medical Association. Professionally, she works with patients of all ages and enjoys helping patients deal with chronic diseases like diabetes and high blood pressure. Dr. Lopez has a special interest in Women’s Health, preventive medicine, office-based research and office procedures. Dr. Lopez has volunteered in clinics in Central America and Hispanic clinics in the United States. She is fluent in both Spanish and English. 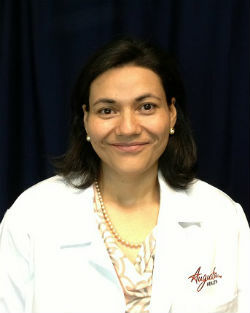 In her free time, Dr. Lopez enjoys cooking, shopping, traveling, exercising, outdoor activities and listening to music. Augusta Health is an independent, nonprofit community hospital whose mission is to promote the health and well-being of our community through access to excellent care. Named one of the 100 Top Hospitals in America by Thomson Reuters in both 2011 and 2012, Augusta Health has also been nationally recognized by HealthGrades for clinical excellence and patient safety and has been named one of America’s 100 Best Hospital by HealthGrades. For more information about Augusta Health, its programs or its services, please contact Public Relations at 540.245.7329 or 540.221.7329, or visit our website, www.augustahealth.com.